The last assignment created some interesting discussions on a couple of the blogs who participated. The main jest was what made a picture a photograph versus a snapshot and does every photograph have to tell a story. This lead to a new challenge put forth at Shrew’s Daily Shutters. Please, read carefully what she is asking for and how to submit your images. Don’t want them getting lost! Snapshot or Photograph? You make the call! This entry was posted in News and tagged challenge, photo, Photography, Shew's Daily Shutters, story. Bookmark the permalink. Thanks for the supportive call-out to this month’s challenge Scott. I don’t know if you intended the above photo to have a story, but I certainly see a wry commentary of the power of Mother Nature vs. human desire. I live where arguments over lake and beach access are constant . . . and I love this photo. Yes, indeed, Mama Nature will go where she wants to go. To me this one represents photojournalism. Perhaps as though covering bad weather and rough surf. Isn’t that what a photojournalists tries to do? To tell a story with a photo? I dunno…I guess the thing I care most about is that I like looking at it. It is a good photograph either way. I like to look at it , too. The powerfull movement of the waves, are underlined by the “non-moving” fence, (I need to learn some more english words…)and to me, this contrast makes it in balance and very plesant to look at. The red sign is a perfect eye catcher. Thank you for the information about Shrew’ s challenge. Interesting how this photo is seen. 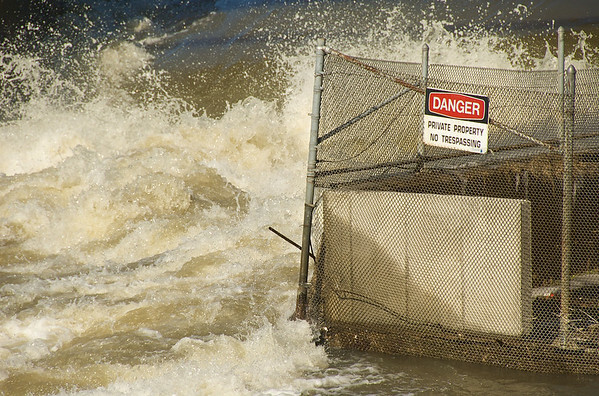 As you don’t know where it was taken you are seeing the water’s power versus a man-made structure. However, the fact this water is like this because of a man-made structure. 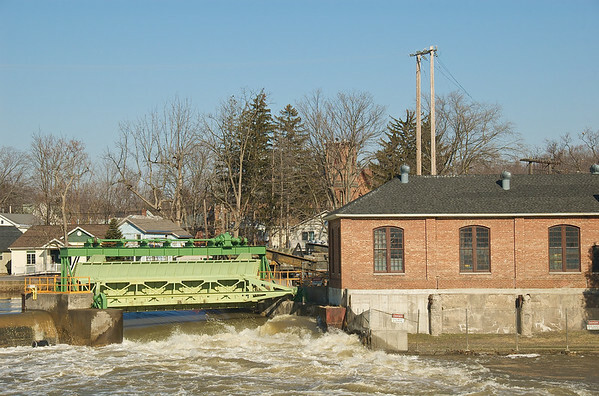 This is the hydro-electric dam on the Seneca River in Baldwinsville, NY. You can see the sign below the brick building on the right. Now, that’s an impressive picture! I couldn’t diferenciate a snapshot from a photograph. For me, they are all images and they all say something to me.